How to create a storyboard. A storyboard is a previsualization of a project which is done in the preproduction phase of film and video making. A story board visually maps out the story, outlines its flow and is a great way to elevate and enhance the project before shooting begins. . So grab your script and a cup of coffee because when it’s storyboard time, it’s decision time. And it can be fun! Choose to draw boards by hand or use digital storyboarding software with artwork included. – No drawing necessary. Create or download a free storyboard template for pencil sketching. Not need to start with templates when using digital storyboarding software. Templates are formatted last based on layout choices made after done composing shots. Draw a series of shot images to represents key moments in your script. The goal is to visually capture the essence of the scene. Create storyboards as if you are making a comic strip. PPS storyboarding software includes storyboard character artwork that simplify and quicken the process of creating concept boards for approval; pitch boards for a producer; shots for crew. Enter bits of dialogue or notes under frames to emphasize, and clarify important moments. A completed storyboard document is a high level view of a project. What does a storyboard contain? A storyboard contains a series of thumbnail images that convey the events in a video or film project. From beginning to end a storyboard highlights key moments. Think of it as shooting your project on paper. Shot by shot, you draw out the script and decide how to visually compose each scene. What is a key frame storyboard moment? How many frames does a storyboard have? the length and complexity of the project. After expressing key moments in images or series of images you can add clarification with additional frames. For a live-action film/video project, add shots between the key moments to visually smooth out the story . For a :30 or :60 commercial, the key moments might be all you need to communicate the idea. Digital storyboarding software makes adding frames or deleting and reordering frames easier than sketching with pencil and paper. How big is a storyboard? And what style to choose? To determine how big or what style/level of complexity first ask who is the audience for the storyboards. The choice can influence the size, style and complexity of your boards. Storyboard made with StoryBoard Quick ‘stand-in’ characters. A simple ‘meet and greet’ scene. But you can use stick figures. Simple storyboards are rough sketches to illustrate the camera setups (shot composition) and main elements of a scene. Quick and clear story boards showing key element placement (actors’ position and size in frame) speed up camera and lighting setup time. Detailed storyboards are used to “sell” a concept and can also serve as a proof of concept. Storyboards can start as simple boards and then progress. Story artists and art directors can be hired for the detailed job of drawing panels by hand, using Photoshop or using storyboarding software that provide paint/draw tools. 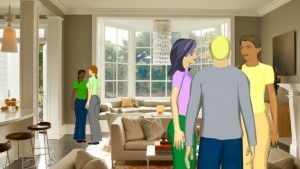 Digital storyboarding enables the use of photos of actual locations, 3D models and/or pre-rendered storyboard art as a substitute for hand sketching. StoryBoard Quick Studio storyboarding software can recreate hand drawn panels with a print-to-sketch feature. What is an Animatic Storyboard? Adding motion to storyboards helps set timing, mood, and pace when layered with music, sound effects and frame transitions. 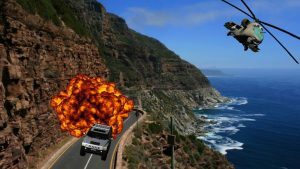 This can be done using Photoshop and video editing software or storyboarding software made to create motion storyboards [also known as: storyreels, animatics or leica reels]. Using PowerProduction’s StoryBoard Artist digital storyboard software, Use the Timeline feature to add sound tracks or place voiceover. Add music and/or special effects in the Timeline and create what is called an animatic.it is easy to add digital photos of real locations for backgrounds. Then layer characters, props and other digital elements on top of the background locations. Production notes/info made when creating a storyboard are not always presented. And when using digital storyboard software [like StoryBoard Artist] it is quick and easy to show or hide information elements. In addition, animation storyboards will add sound tracks first and build out their animation (key frame style) around the sound. For instance, commercial storyboards use key frames to show script ideas/concepts and product placement. Each frame is contains enough details to persuade clients to buy the concept for the client’s message. Since commercials are typically short, info needs to be communicated quickly. Captions or sound tracks give Voice Over (announcer) dialogue and music cues. 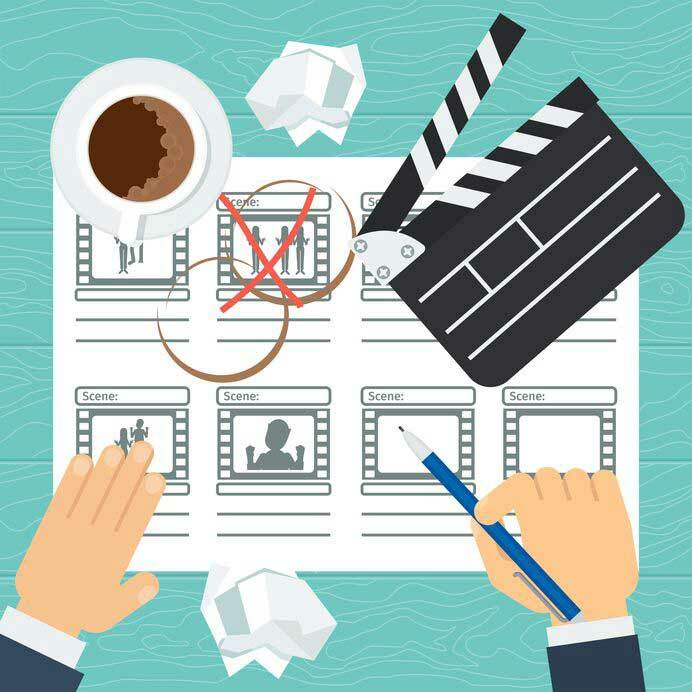 Furthermore, ad agencies and commercial production houses use printed boards and/or animatics to sell their ideas to the clients. The storyboard process helps the agency and client understand the vision of the commercial and helps visualize the feel and tempo. Agencies will also distribute boards to production houses to facilitate the bidding process. Non-linear or branching project development starts with mock-ups of the idea, usually for elearning. For this reason, refining details, especially prior to rendering or coding, saves programming time. And most important, project storyboards allow for creative input and idea expansion at this early stage of production. Focus on the elements (characters, props, locations) needed in the frame. Select a shot type to communicate the emotion you want to convey: Long Shot, Medium Shot, Close Up, POV. Finally, what if you can’t draw? The best part is that you can storyboard even if you can’t draw. No drawing skills needed when you story board in Storyboard Quick. 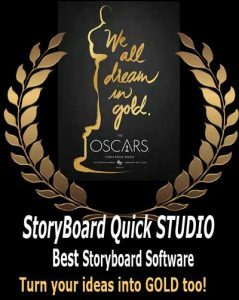 Or if you simply want to storyboard fast and efficiently, you don’t need to be a graphic artist to do so when you story board with Storyboard Quick. Communicate ideas quickly and in style. StoryBoard Quick has built-in storyboard artwork and choices of professional storyboard templates. But, if you can draw, grab a pencil or marker and use one of our Free Storyboard Templates. Or look at our StoryBoard Artist Studio version for tablet drawing as well as a 3d stage. This is a great article. Thanks so much for your explanations! Let us know what you’re working on. We can help you get started.